The 17th century was the period when Europe's rulers discovered opera. It fitted in with the theories about princely magnificence and so if you were in any way musically inclined you could have a court composer who set texts from the court poet, with elaborate sets and costumes too. The most theatrically inclined had theatres, the others used a temporary space. These were not public performances in our sense, they were displays of princely magnificence. 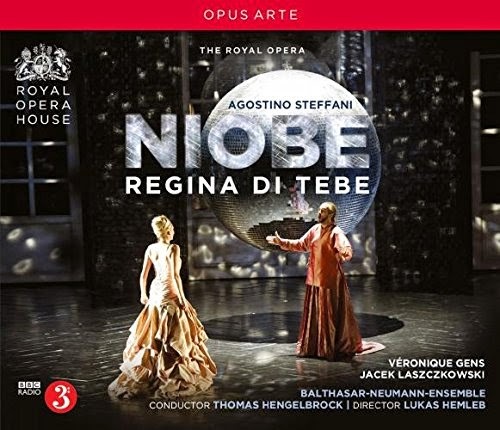 Opus Arte has given us an opportunity to hear one of these, Niobe, Regine di Tebe by Agostino Steffani (1654-1728) which was written for the Duke of Bavaria in Munich in 1688 and premiered during the carnival season. It is heard here in a performance from Covent Garden in 2010 which was actually a revival of a production originally seen in 2008 at Schwetzingen. Thomas Hengelbrock conduced his own Balthasar-Neumann Ensemble with Veronique Gens as Niobe, Jacek Laszczkowski as Anfione, Iestyn Davies as Creonte, Alastair Miles as Poliferno, Delphine Galou as Nerea, Lothar Odinius as Tiberino, Amanda Forsythe as Manto, Bruno Taddia as Tiresia and Tim Mead as Clearte. The problem with 17th century operas is that they were often written for the greatest virtuosi of the day and modern revivals can sometimes be in the hands of small opera companies, where talent and enterprise do duty for the highest levels of technical virtuosity. This recording gives us a chance to hear a performance by a modern day cast of virtuosi and to appreciate fine music sun by great artists. Opera of the period tended to large casts with a network of interlocking stories, frequently mixing serious aristocrats with comic servants (in what might be called the Venetian manner - think Monteverdi and Cavalli) Here Steffani and librettist, Luigi Orlandi have come up with something a little more sober. There is only one servant, and her music is lighter but not comic. The other personnel are entirely serious and the opera's moral of pride comes before a fall, with the deaths of Niobe and Amfione, is offset by a pair of young lovers and the crowning of the rightful King, Creonte, in place of Niobe and Amfione. That said, there are some pretty wacky goings on along the way, including the rebuilding of the walls of Thebes thanks to Amfione's singing and a scene where Creonte, anxious to experience Niobe's 'beauty' for himself, pretends to be the god Mars and has a liaison with Niobe who thinks herself let to heaven. The results are a trifle confusing unless you follow the synopsis and libretto (both included in the CD booklet). It is a long piece (even though act three has cuts in the music) there is almost three hours of music with 42 short arias and duets. In style Steffani hovers between Italian and French (he was born in Italy but went to Munich as a choirboy and did much of his study there). Listening to the performance from Thomas Hengelbrock and the Balthasar-Neumannn Ensemble is a great pleasure. The lead roles are Amfione (Jacek Laszczkowski) and Niobe (Veronique Gens) whose hubris at the end causes their death at the hands of the gods. Amfione retires from ruling and turn mystical so we have a wonderful scene in the palace of harmony. Niobe is a role notable to modern ears for the profound final scene where she sees her children die and turns to stone in despair. Here Steffani shows himself, despite a hint of note-spinning sometimes, to be able to write music of real power and Veronique Gens brings this out. How you react to the set will, to a certain extent, be based on how you like Jacek Laszczkowski's high counter-tenor voice. It goes high into the mezzo-soprano range and has a soft-grain to it with substantial vibrato. At the some some found it magical, but others including myself were not so sure (Anna Picard wrote in The Independent that his 'chromatic sobs sound like an elderly aunt coughing into a handkerchief'). It is a very specific timbre and over a whole opera on CD I found the lack of variety and tone colour in the high passages worrying. But there were also some magical moments. Iestyn Davies is Creonte, who is crowned ruler of Thebes at the end. Iestyn Davies turns in a suitably virile performance. He is aided by the mage Poliferno (Alastair Miles) who brings in a hint of black magic with his calling of the aid of the spirits of the underworld and has been giving Creonte dreams of Niobe to spur him on. It is this ambivalence which makes the opera fascinating. The 'good' king is aided by a black mage and actually is obsessed with the 'bad' queen to the extent of having a liaison with her. And the 'bad' king and queen are highly sympathetic. So we are never quite sure of where we are. Running through the piece also are the younger lovers Tiberino (Lothar Odinius) and Manto (Amanda Forsyth), with Tiberino in fact also aiming to conquer Thebes. Manto's father is Tiresia, the High Priest of Latone, who is prone to telling Niobe off and for prophesying that Tiberino will not be successful in his quest, though Tiberino does get the girl as well. The final two characters would seem to be extras, but of course plots being what they are, the two crop up significantly. Delphine Galou is Nerea, nurse to Niobe's children whilst Tim Mead is a courtier who spends the entire opera in love with Niobe and is foist in Amfione's throne when Amfione stands down. Steffani clearly took great pains with the piece, it was his last opera for Munich before Steffani moved to Hanover as Kapellmeister there (Handel's predecessor). Many of Steffani's later operas are in manuscript in Buckingham Palace Library, brought over with George I. Steffani's later career was more as diplomat than composer. The piece is written for a large ensemble (with trumpets and drums in the overture) and Steffani includes includes instruments in addition to the standard continuo ones in the arias making the piece rather grander impressive. Five of Amfione's arias have additional instruments playing throughout in what would become the later fashion. Rather ironically, this set has been issued hot on the heels of one from Boston Early Music Festival, directed by Paul O'Dette and Stephen Stubbs on Warner Classics. That has Philippe Jaroussky and Karina Gauvin in the roles of Amfione and Niobe, which may certainly swing it for some people, especially as Paul O'Dette and Stephen Stubbs use a fuller edition than Thomas Hengelbrock. It seems rather ironic that having studiously ignored Steffani for years, the performing and recording industry should hit on two different performances of the same opera. Let us hope we do not have to wait too long before we can hear some of Steffani's other operas. I did enjoy this set despite the caveats. It was designed for carnival, and Thomas Hengelbrock keeps things bowling along in a lively and engaging fashion. That it was recorded at live performances mean that the cast's delivery of the recitative is immediate and engaging. It is probably still too early to be certain quite where Steffani lies in the operatic panolpy, we need to hear more of his works, but here there is quite enough to delight and seduce. Images from the 2010 stage production are available on the Royal Opera House's Flickr website.